Forget the manilla envelopes and other fancy marketing gimmicks, sliding your notebook into one simply won’t impress people like it did during the Macbook Air’s launch at the 2008 Macworld event. With Tablets now raising the bar in consumer device thinness, or should I say slimming it down further, Ultra Portables like the the Dell Adamo, Samsung 9 Series and Macbook Air have more of a reason than ever to justify their existence. With the upcoming iPad 2 and so many new Android Honeycomb tablets fast approaching, the low voltage, luxury notebook quasi netbook market has truly become a niche arena. But ironically enough, the competition tablets represent to ultra portable notebooks, might just offer them a new lease of life. In fact its my view that Steve Jobs might just be right. These intrepid little machines could be the future of notebooks full stop. When the Air was first launched, it was a 13 inch super slim notebook with frustratingly limited I/O ports and an ungodly price point. 2 years later and Apple have remolded the Air into something that they’ve marketed as a cross between an iPad and a MacBook. The result is this beautifully re-imagined 11 inch offspring and a lower entry level price. All in all, they delivered a more crowd pleasing ultra portable and I’m happy to say I finally ‘Get’ what the Air is all about. It now features a second USB port, something users had been begging for in the previous 2 generations, along with a far higher native resolution display of 1366 x 768 and 64GB of Flash Storage, upgradable to 128GB. The basic config we got our hands on is the 1.4GHz Core 2 Duo model but it can be expanded to 1.6GHz. 2GB of DDR 3 memory and the impressively powerful integrated GPU from Nvidia, the Geforce 320M. The 13 inch edition continues of course offering more storage options all the way up to 256GB, more CPU horsepower at 1.8GHz Core 2 Duo and the addition of an SD Card slot. The basic entry level 11 inch Air will set you back €999, thats the same price as a White MacBook. The 13 inch starts from €1,299. Although both machines remain pricey, their highly compelling. Weighing in at just 2.3 pounds, the 11 inch offers the best all round bang for the buck. It’s incredibly thin without feeling fragile. The rigid solid aluminum unibody does an excellent job at keeping things together in a neat chassis that won’t break your back. One thing I’ve enjoyed in using this machine is the ability to walk around with it in one hand quite comfortably, while typing with the other and not experiencing any arm fatigue. It really does combine the best of a tablets portability with the features of a notebook given its excellent full sized chiclet-style keyboard. The multi touch glass trackpad remains a joy to tap, scroll, swipe, pinch and zoom with. Allowing for easy access to open applications via expose with a single 4 finger swipe down. Of course Apps like iPhoto come alive in a whole new way when using Apple’s trackpad with any MacBook. As with all Mac laptops, their are basic standard features we’ve come to expect. A gorgeous glossy display, a FaceTime Camera, MagSafe connection and iLife preinstalled. Although iDVD isn’t much good to you without purchasing the external DVD superdrive. Of course we need barely mention the absence of a DVD drive in these modern day ultra portables. After all, thats what helps make them ultra portable in the first place. With more and more of our media going into the cloud or in the new Mac Apps Store, a DVD drive is certainly not missed on this machine. For those of you needing a more complete work machine then the MacBook or MacBook Pro will fulfill your needs nicely, offering more CPU Power, DVD drives, FireWire and SD Card Slots, along with more RAM and Storage options. For those needing a lightweight, easy to carry, slim and quick notebook, then the Air is an elegant and trusty solution. Although I was disappointed to find it has lost its backlit keyboard. Evidently in the push to reduce weight and size as well as production costs, something had to give. Apple’s bold move to make use of Flash Storage exclusively in the new Air has certainly paid dividends to system performance. This machine boots up in just under 12 seconds, thats faster than my iPhone or an iPad. Applications open silently and quickly and feel snappy and responsive. The Geforce 320M offers one of the better mobile graphics solutions on the market today and I feel that only the screen size itself will prevent this from being the nice little gaming Mac that some would hope for. That said it will impressively drive a 27 inch Apple Cinema display via the mini display port. The display feels just a tad small at times, certainly I find it an occasional strain to do extensive work on a 13.3 inch Macbook Pro to say nothing about loosing 2 more inches. It’s fine for surfing the web and using one or two iLife applications at once. The display is still larger than a standard Netbook, which usually only come in at the 10 inch mark. As with all laptops, in my view, you just have to try before you buy to see if its right for you. Using legacy Core 2 Duos as the power plant was surprising. But considering the hubub surrounding Nvidia and Intel’s recent lawsuit, Core i3 was off the table. For this kind of machine, power is not essential. The Air is not the machine for heavy 3D graphics processing. Incidentally recent benchmarks have indicated that the upper level 1.86 GHz 13 inch MacBook Air’s are not all that far behind their bigger MacBook Pro cousins. That leaves us with battery life. The previous estimates on last generation MacBook Airs of 5 hours seemed suspiciously ambitious. When I reviewed the 2009 edition I could barely scrape passed 3 hours with some light surfing and the occasional sneaky YouTube Video. Todays Airs offer a more realistic 5 Hours for the 11 inch version and 7 hours for the 13 inch. Apple has learned many lessons from the first two slow selling generations of the Air. Now in its third year the thinnest Mac of all has finally carved out its niche customer base while offering a glimpse into the possible future of Notebooks. With a lower price point, beautiful design, impressive performance given the modest specs, the Air is a delight to use and will fit neatly for travel on the fold out table top for your next flight. If your looking for a well rounded ultra portable that offers decent performance and a balanced mix of features between a notebook, netbook and tablet, then the 11 inch Air is for you and if I’m being honest, this ones for me too. First off, great to see you with your own website Dave, looks great! Second, thanks for the review. I am off to Vegas on Sunday and am considering buying the new macbook pro 15 inch over there. (As it will save me some money) But would anyone reckon as my primary computer, if this will be better than waiting for the new gen macbook air later in the year? I am soo conflicted! Not going to use it for gaming. Mainly internet browsing, basic photoshopping etc. Also, power brick wise. Would you get away with using a travel adapter here untill I buy a 3 pin version. You’ll be fine with an adapter, just make sure you get one with a voltage converter from 240v to the American 115v. 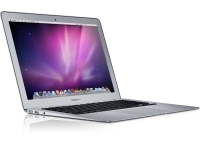 I hated the first MacBook Air for its price and design. The new MacBook Air one however is a very nice, Apple learned from their mistakes when building this product and made a fine machine. I would take one of these over an iPad any day. My friend has a MacBook Air and I’ve played around on it quite a bit. It’s a very nice machine and you can’t argue with the tiny form factor, but it’s still hard to justify the $1000 price tag when there are tons of other netbooks out there for much cheaper.